Mezco Toyz have revealed what their upcoming 15″ Chucky doll looks like. This version is based on Chucky as seen in the original Child’s Play film. Unlike the scarred and battle-damaged look Chucky normally displays (people have tried to destroy him in 6 films so far), this version represents the cleaner, earlier Chucky. His trademark outfit is un-slashed, his face is not yet mauled. Just as he did in his films, Chucky has lots to say, from his trademark “My name is Chucky” to far more sinister phrases. 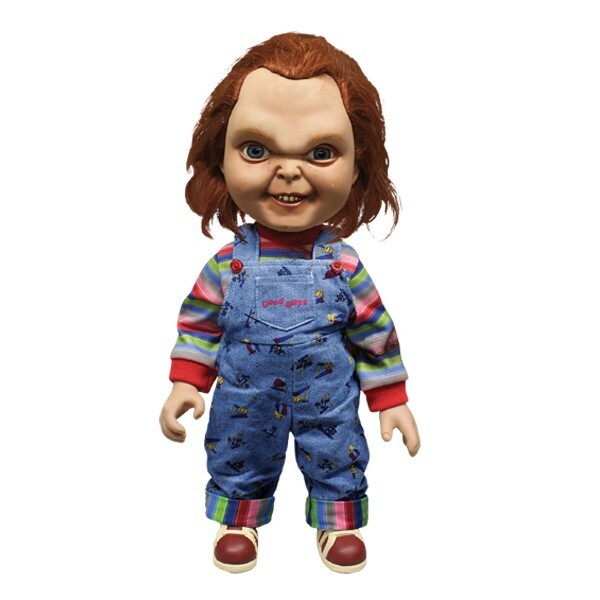 The star of the Child’s Play films, Chucky stands 15″ tall and features real cloth Good Guys clothing, 11 points of articulation, and his trademark orange hair and realistic glass-like eyes. It ships in October 2014 and is available to preorder for $94. Thanks to DreadCentral for the news. This article was posted March 8, 2014 at 11:54 am. That looks absolutely nothing like Chucky.I’ve been a fan since before I was a teenager and have watched every single movie. I even admit to owning a doll or 2 and even some items I treat as collectibiles. Get it together makers. I definitely won’t be buying this one.